We did it! We finally joined the 21st century and bought a flat screen! When we could no longer read the words at the bottom of news casts, we decided it was time. I knew I wanted the TV mounted on the wall with the cords hidden, but then the question of what to put under the TV arose. 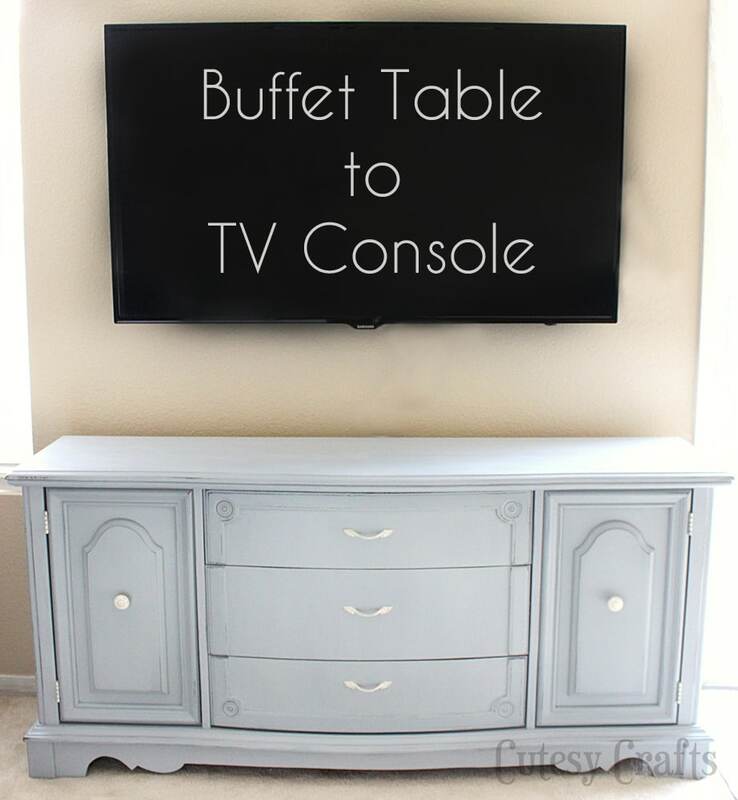 Eventually I decided that a buffet table would make the perfect TV console. Lots of storage, perfect length, and it doesn’t stick out too far from the wall. After searching craigslist for a couple of days, I came across this beauty and sent my husband, Joe, to go pick her up. Thanks Love! The previous owners said that there used to be a hutch on top of it, so keep that in mind when you are searching for your perfect buffet. Here’s a nice before and after. Huge difference, right?! 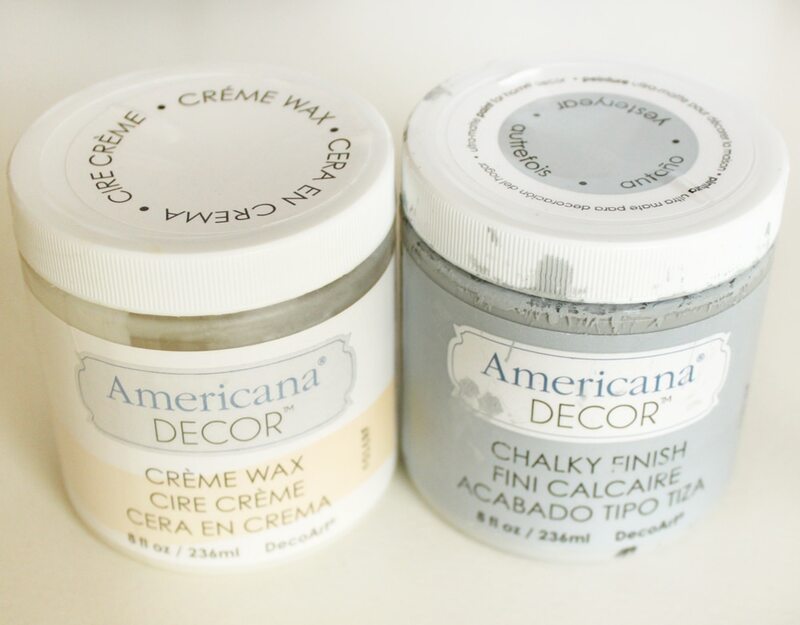 DecoArt sent me some of their new Americana Decor Chalky Finish paint to try out for this project. (DecoArt sent me the paint for free. No other form of compensation was received. All opinions are my own.) I chose the color Yesteryear, which I thought would be more gray, but it ended up looking pretty blue in my house. Works for me though, because you know I like blue! I painted two coats of the paint to get good coverage on the dark wood color and then did a little sanding on the edges to distress it. To protect the paint job, I applied the Americana Decor Creme Wax with the special waxing brush and then buffed it with a rag. 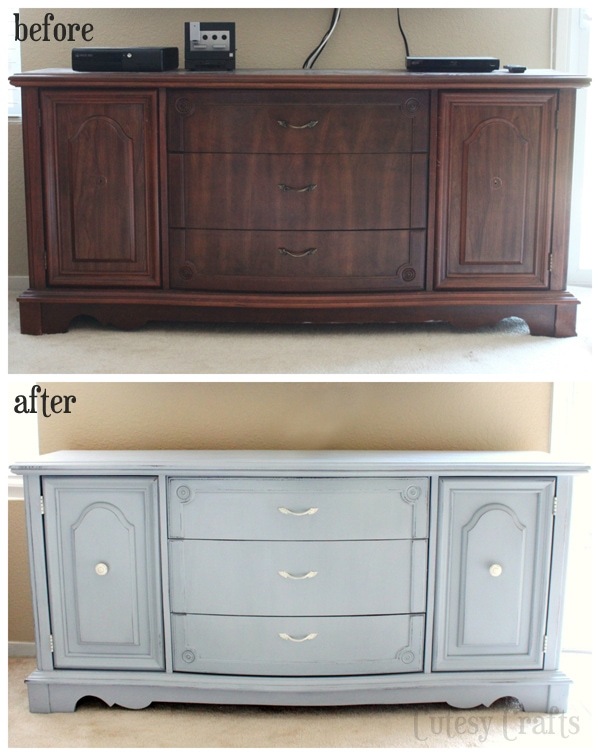 Remove the hardware from the buffet, paint it with the same kind of paint (different color), and wax just like you did for the main piece. It came with no knobs on the doors, so we had to pry open the doors with a butter knife. Not good. I got some dark metal knobs and painted them white to match the pulls. I also painted the hinges white. So much better! The back of the buffet is that weird cardboard-type stuff. I didn’t feel like painting it, so I got some cute shelf liner and put it up. Joe cut some holes in the back to feed the cords through, so I could hide the DVD player and X-Box. Now we just open the door when we want to use them. 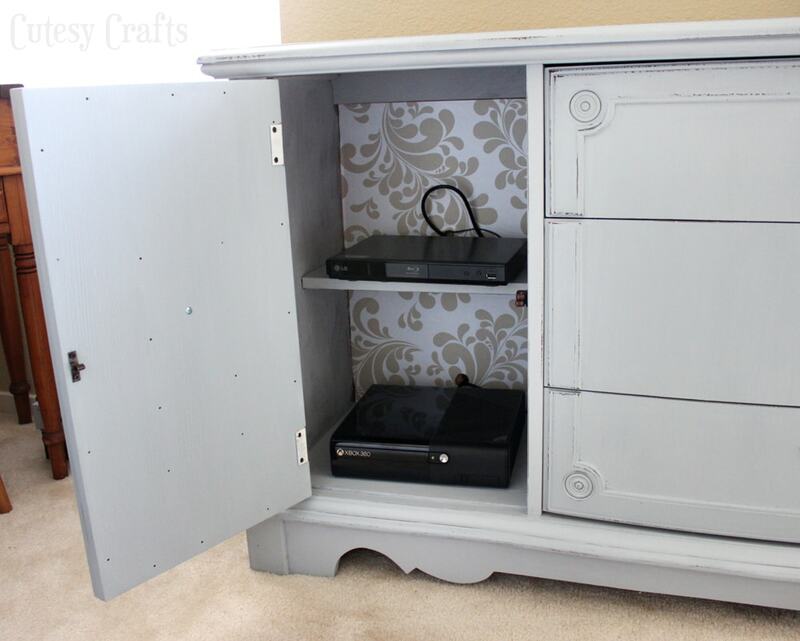 The drawers are great for holding the remotes, DVDs, video games, and other random stuff that needed a home. Do you love it?! I definitely do! Now I just need to decorate the top of the table. Suggestions? I’m so bad at that sort of thing! Wow, this looks SO great!!! I love the color and finish. Wonderful job! We are looking for some kind of buffet/dresser to transform into a media console as well…once we get around to it, I may totally copy your paint color, I just love it!! Love it! Domesday I hope to have the guts to paint on furniture. It looks really good. Thanks, Donna! You’ve got to try it! It’s so easy and makes such a big difference. Jess this turned out fantastic! Love the chalky paint finish and welcome to the flat screen TV world. LOVE it! Love the color and that shelf liner paper is super cute too. Great job! 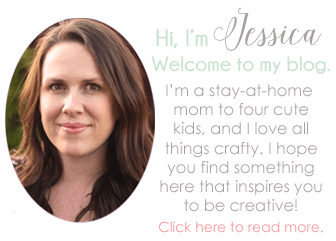 I LOVE this furniture transformation, Jessica. 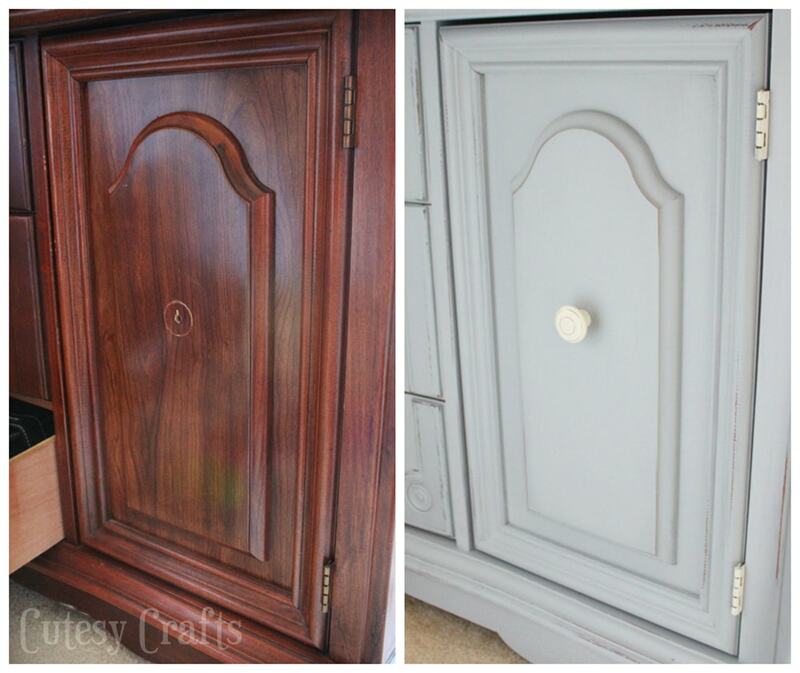 From the colors to the distressing to the shelf liner. Fantastic work! 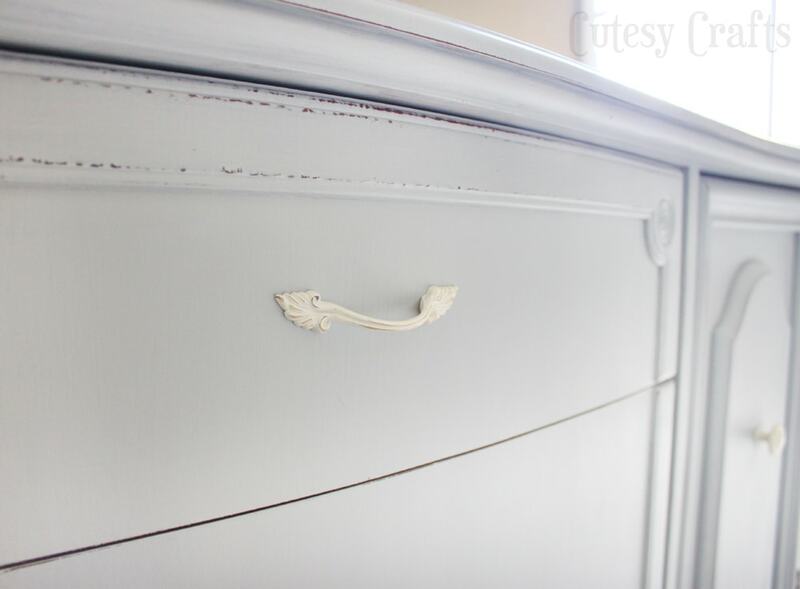 It also gets me excited to try out this chalky finish paint…it sounds so easy to work with! Brava! Thank you, thank you. It was so easy and makes such a big difference! If you wanted to bring out some black on the distressed part, would you use brown wax, advise please?distressed apiece red over black and now I am ready for my next step and I want to bring more black out, what do you suggest..
You can try sanding more to bring out more of the black. The dark wax goes into the nooks and crannies of the furniture to bring out the details. Maybe try googling brown wax to see some examples? I’ve only ever used clear wax, so I can’t tell you too much about it. Sorry. Wow Jessica! It looks great! Hey Jessica amazing job looks great. How long does it take for this paint to dry? Do you have to use the wax? And is that before or after the paint? Thank! Thanks, Eva! It dries pretty quickly. By the time I finished painting one coat, I was ready for the second. Yes, like all chalk paints, you need to use the wax. 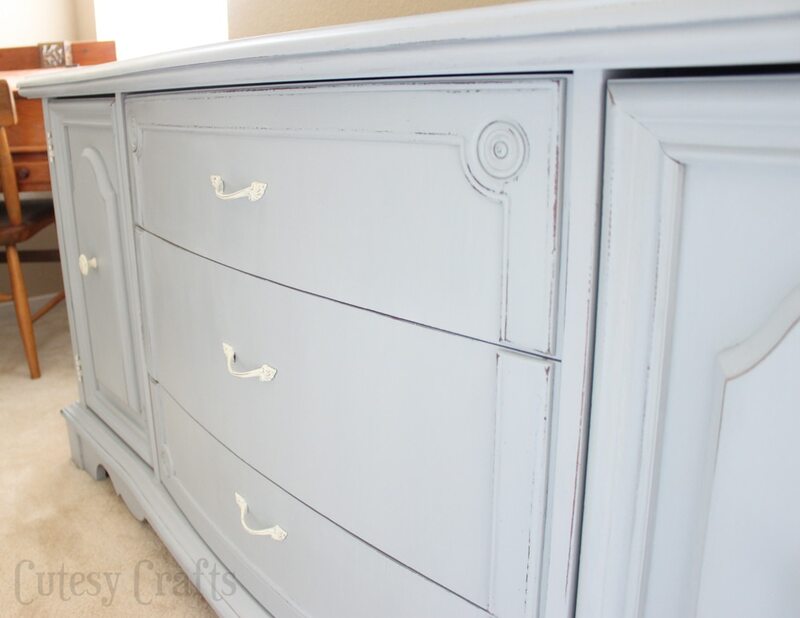 The paint has a really weird (chalky) finish if you don’t. It also protects the paint from scratches and stuff. You do that after the paint. You can choose to buff it to make it a little shiny or leave it with a matte finish. 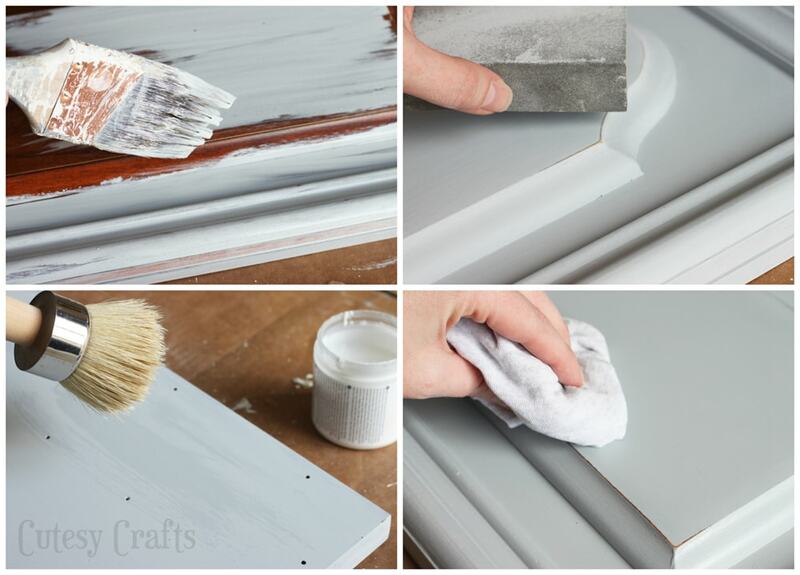 If you are doing a table top or something that is going to get a lot of wear, you will probably want to do more than one coat of wax on the top. DecoArt’s website has some great video tutorials to show you how to use the paint. Oh, and if you want less brush strokes, you can dip your brush in a little bit of water when painting the second coat. Hope that helps! Yup helped tons actually. Thank you I will now be doing this for sure tomorrow. Was a bit hesitant but now definitely am up for the challenge. hey, great job ! Can you tell me the number or the name of the color ? The color name is Yesteryear. It’s Americana Decor Chalky Finish Paint, and you can buy it at Michael’s. Curious … did you use one jar of the paint? I am looking at buying some from Michael’s here in Canada … and so far … anyone in the store I’ve asked doesn’t seem to know much (they are all very young in the store I go to). I have 2 little tables that are circa 1940 … and are same colour as your cabinet you did … so may go the same route as you have done with the colour … and this will “update” my boudoir abit. For the big buffet, I think I used about one and a half of those little jars. Yes, I like to distress it first and then wax. You can use a cloth instead of a brush. I think the brush just makes it so you use less wax because it spreads it out easier.